Just as many Americans erroneously think that federal spending has grown considerably, many also believe that taxes have increased substantially. 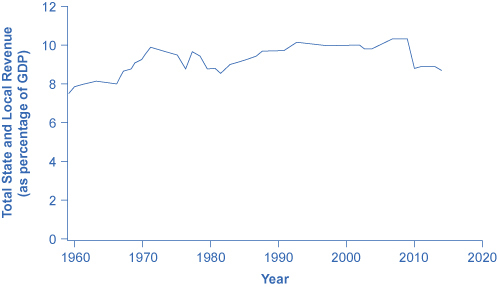 The top line of Figure 1 shows total federal taxes as a share of GDP since 1960. Although the line rises and falls, it typically remains within the range of 17% to 20% of GDP, except for 2009, when taxes fell substantially below this level, due to recession. 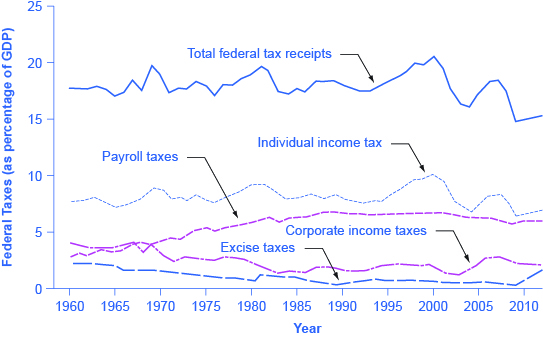 Figure 1 also shows the patterns of taxation for the main categories of taxes levied by the federal government: personal income taxes, payroll taxes, corporate income taxes, and excise taxes. When most people think of taxes levied by the federal government, the first tax that comes to mind is the individual income tax that is due every year on April 15 (or the first business day after). The personal income tax is the largest single source of federal government revenue, but it still represents less than half of federal tax revenue. The second largest source of federal revenue is the payroll tax, which provides funds for Social Security and Medicare. Payroll taxes have increased steadily over time. Together, the personal income tax and the payroll tax accounted for about 84% of federal tax revenues in 2012. Although personal income tax revenues account for more total revenue than the payroll tax, nearly three-quarters of households pay more in payroll taxes than in income taxes. Taxes can be described as progressive, proportional or regressive depending on how the marginal tax rate one pays changes at different income levels, as described in the feature below. Marginal tax rates are closely related to the concept of tax brackets. The income tax is designed to be a progressive tax, which means that the marginal tax rate increases as a household’s income increases. As your income rises, you move into a higher tax bracket, which means you pay a higher rate on that additional income. Taxes also vary with marital status, family size, and other factors. Progressive taxes are justified by the ability to pay principle, which argues that citizens with more income or wealth should pay at a higher rate since they have a greater ability to pay. Contrast this with the benefit principle, which argues that tax payers should pay in proportion to the benefit they receive from public goods or services. Thus, if you receive the same benefit, you should pay the same tax. The marginal tax rate (the tax rate that one pays on the highest income they earn) for a single taxpayer range from 10% to 37%, depending on income, as the following feature explains. HOW DOES THE MARGINAL Tax RATE WORK? Suppose that a single taxpayer’s income is $35,000 per year. Also suppose that income from $0 to $9,075 is taxed at 10%, income from $9,075 to $36,900 is taxed at 15%, and, finally, income from $36,900 and beyond is taxed at 25%. Since this person earns $35,000, their marginal tax rate is 15%. The key fact here is that the federal income tax is designed so that tax rates increase as income increases, up to a certain level. The payroll taxes that support Social Security and Medicare are designed in a different way. First, the payroll taxes for Social Security are imposed at a rate of 12.4% up to a certain wage limit, set at $117,900 in 2014. Medicare, on the other hand, pays for elderly healthcare, and is fixed at 2.9%, with no upper ceiling. In both cases, the employer and the employee split the payroll taxes. An employee only sees 6.2% deducted from his paycheck for Social Security, and 1.45% from Medicare. However, as economists are quick to point out, the employer’s half of the taxes are probably passed along to the employees in the form of lower wages, so in reality, the worker pays all of the payroll taxes. The Medicare payroll tax is described as a proportional tax; that is, a flat percentage of all wages earned. A flat tax is a proposal that the federal income tax system be proportional, so that instead of tax brackets, everyone would pay the same percentage of their income. The Social Security payroll tax is proportional up to the wage limit, but above that level it becomes a regressive tax, meaning that people with higher incomes pay a smaller share of their income in tax. Taxes can be categorized as progressive, proportional or regressive based on how their marginal tax rate changes as income goes up. A tax is progressive if you pay a higher marginal tax rate as your income rises. A tax is proportional if your tax rate doesn’t change as your income rises; i.e. you pay the same rate at every income level. A tax is regressive if you pay a lower marginal tax rate as your income rises. The third-largest source of federal tax revenue, as shown in Figure 1 is the corporate income tax. The common name for corporate income is “profits.” Over time, corporate income tax receipts have declined as a share of GDP, from about 4% in the 1960s to an average of 1% to 2% of GDP in the first decade of the 2000s. The federal government has a few other, smaller sources of revenue. It imposes an excise tax—that is, a tax on a particular good—on gasoline, tobacco, and alcohol. As a share of GDP, the amount collected by these taxes has stayed nearly constant over time, from about 2% of GDP in the 1960s to roughly 3% by 2012, according to the nonpartisan Congressional Budget Office. The government also imposes an estate and gift tax on people who pass large amounts of assets to the next generation—either after death or during life in the form of gifts. These estate and gift taxes collected about 0.2% of GDP in the first decade of the 2000s. Other federal taxes, which are also relatively small in magnitude, include tariffs collected on imported goods and charges for inspections of goods entering the country. The main revenue sources for state and local governments are sales taxes, property taxes, and revenue passed along from the federal government, but many state and local governments also levy personal and corporate income taxes, as well as impose a wide variety of fees and charges. Property taxes are taxes based on the value of your home or other real estate. State or local authorities assess the value of your real estate. Property taxes are a percentage of that value. Sales taxes are taxes on (and a percentage of) retail purchases. Sales taxes are known to be regressive since the lower one’s income the greater proportion of the income one pays in sales tax. For this reason, some states exclude purchases of groceries and/or medications from sales tax. The specific sources of tax revenue vary widely across state and local governments. Some states rely more on property taxes, some on sales taxes, some on income taxes, and some more on revenues from the federal government. Figure 2 illustrates state and local taxes as a share of GDP. Watch this video to see examples of the various types of taxes and to learn about the importance taxes play in generating revenue for a country.